Looking to add fencing that complements your modern architectural style? Or perhaps you just prefer a sleeker feel when it comes to your outdoor decor. Slat fencing might be for you! 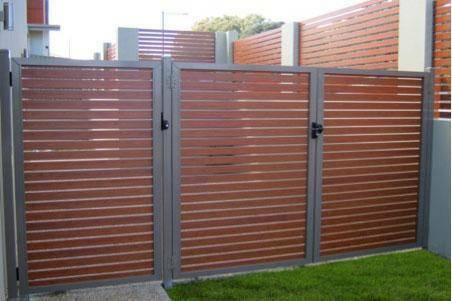 Providing high quality services in Perth, this style can be used in any outdoor areas such as for garden and pool fencing. Ezi-Slat comes in a wide range of finishes, including a wood-look and more traditional powder coat finishes such as silver, black and slate grey. This enables you to choose the style that suits your decor, without having to compromise on quality. People use Ezi-Slat in the same function as they would any other fence. It provides additional security, privacy, and a barrier between areas. It can contain pets and children, and provides a decorative feel. Aluminium is a recyclable material and is very long-lasting, which means you won’t have to worry about replacing your fence any time soon. No chemicals leach into the surrounding soil from your fence, and installation is fast and easy and therefore has a minimal impact on the environment. All Ezi-Slat fences are made in Australia. Alternatively, you can consider COLORBOND® Slat Fencing options, a hard-wearing and secure fence that Team Work Fencing has also been installing for decades. Benefits include durability, security and privacy, design flexibility, easy maintenance, and a low environmental impact. Would you like to find out more about our fencing supplies, services and cost? Why not contact us today? You can call us for a free quote in Perth on (08) 9450 1626 or in the South West on (08) 9795 3447.